Change is good. Change is refreshing. Change for many of us, keeps us on our toes and doesn't allow complacency to sink in. For four years, University of Connecticut basketball prodigy, Maya Moore hypnotized us with her effortless play and Jordan-esque characteristics on the court. Her collection of accolades and honors would make any student-athlete salivate for just one of those recognitions. Awards include being named two-time Honda Sports Award as the top female basketball player and 2009's recipient of the John Wooden Award after leading the Huskies to a national championship. She has no doubt transcended women's college basketball, taking the sport to a higher level than what it was before. Moore, the No. 1 overall pick in the WNBA draft, will continue to showcase her stop-on-a-dime jumpers and precise inside-the-lane drives, this time with the Minnesota Lynx. 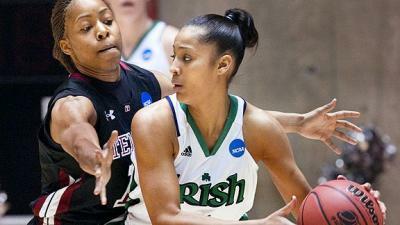 Don't worry, though, the college game is in good hands with University of Notre Dame's Skylar Diggins. The feisty point guard burst onto the scene this season, leading the Fighting Irish to the national championship game, ending its season as the runner up to Texas A&M and an overall 31-8 record. Diggins is the game's new fresh face. Throughout the Fighting Irish's whirlwind ride, the sophomore's notoriety has grown and in return, caught the eye of music's elite - rapper Lil Wayne and Chris Brown. Her Twitter account has reached over 100,000 followers and she has been a trending topic for over 24 hours at one point on the popular social networking site. In a world where people are fascinated with how the beautiful people of Hollywood live their lives, Diggins has people smitten, interested and wanting more. Very seldom does college basketball toy with celebrity, especially when it comes to the women's game. The circumstance is unchartered territory for a sport that, on occasion, will have a notable figure in the crowd. The camera will pan and the sideline reporter will work magic, conducting a brief interview to kill time. That's it. There is just something different about Lil Wayne rocking a No. 4 Diggins jersey and the justice it does for Notre Dame Basketball and the college sport. Wayne travels the world and performs for thousands each night. His lyrics speak volumes and his fashion threads are what some kids are wearing the next day. With overnight popularity comes a certain standard one is held to. Diggins hasn't flinched, facing adversity head on and handling it with class. From a fan's perspective, if this is any idication of what's to come, I'd say we are in for a treat.